Strangely, no one would ever ask this question when you are surfing on the web. Unless you are in a chat, on a private logged area or on twitter, there is no ways to know who is visiting a website at the same moment that you. You just know that the internet keeps growing, on and on, bigger and bigger. Same here in Second Life, the world is larger, wilder, and the community, engaged and strong, develops itself worldwide. Linden Lab's late figures & metrics are here to attest on this, and they are quite impressive. 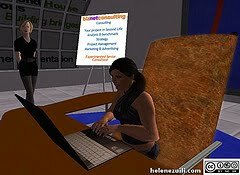 In total, users around the world have spent more than one billion hours in Second Life. That's roughly 115,000 years spent doing everything from meeting and socializing with friends; to attending live concerts; to creating, selling, and shopping for virtual goods; to learning a foreign language; to attending business meetings; and much more. User hours grew 33% year-over-year to an all-time high of 126 million in Q2 2009. 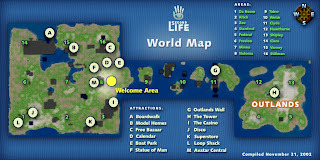 Second Life Residents spend an average of about 100 minutes inworld per visit. This average session time is significantly greater than those seen with popular social networking websites and reveals the uniquely high level of engagement Residents have with Second Life. More than 18 billion minutes of voice chat have been used in Second Life since voice was introduced in 2007. Voice minutes grew 44% year-over-year from Q2 2008 to Q2 2009, and more than six billion minutes of voice have been delivered in 2009 alone, making Linden Lab a major VoIP provider. Approximately 1,250 text-based messages are sent every second in Second Life, and more than 600 million words are typed on an average day. Roughly 60% of active Second Life Residents based outside of the US, representing more than 200 countries, and the Second Life Viewer available in 10 languages. That is just about communications.... But if you look at the land it is even more striking. .. and this is Second Life in 2009. 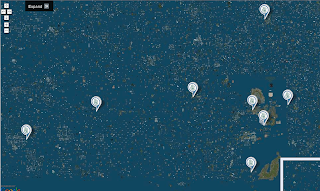 The total land area of Second Life is now equivalent to approximately two billion square meters – roughly the size of the state of Rhode Island. Land in Second Life has grown roughly 18% from Q1 of 2009 and approximately 75% since Q1 of 2008. As the creator and original seller of all virtual land in Second Life, Linden Lab is not only the provider of the worlds largest platform for user-generated virtual goods, but also a leading virtual goods vendor itself. 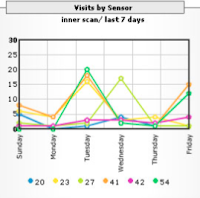 Ok, so if all of those datas are true facts, what is the problem ? Well, imagine that you open a shop, a hotel, a library, or any commercial place in the middle of nowhere somewhere in France, or England, or anywhere in the world. How would you expect anyone would know about it and arrive there - except in the Bagdad Café movie, you know, as we know, this is all about advertising and marketing. Setting a presence in Second Life is not only about building the most beautiful headquarters, with great functionnalities, that you can buzz all over the net. It is also and primarily about building a faithful and engaged audience which will fill the place (under control) on a daily base. It starts by working on organic search the way you would work on the SEO of your website, and deploying a real strategy of content, links, conversations, and useful services for the community you target, for a maximum visibility and traffic. 0 Response to "Ever feel alone in Second Life ? A strategy for empty business islands..."